This recipe can be doubled without any extra effort — just make sure you use a large enough pot. 2. Melt the butter in a large pot over medium-high heat. Add the sugar, water, lemon juice, and corn syrup and bring the mixture to a gentle boil, stirring to dissolve the sugar. Once the mixture boils, stop stirring. Brush down any sugar crystals clinging to the sides of the pot with a pastry brush dipped in water. 3. Clip a candy thermometer to the side of the pot and cook for 15 minutes, or until the mixture reaches 300°F (150°C). If the mixture threatens to boil over, lower the heat as necessary. (If the liquid is too shallow for the thermometer to measure the temperature, tilt the pot to get an accurate reading.) Resist the temptation to stir; if the caramel is not coloring evenly, swirl the pan from time to time. 4. Remove the pot from the heat and stir in 2 cups of the almonds. Quickly spread the caramel in an even layer on the prepared baking sheet. Let cool completely. Spread the chocolate over the top of the caramel, then sprinkle with the remaining 1 1/2 cups almonds. 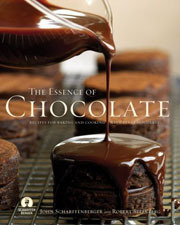 Let the chocolate harden at room temperature or in the refrigerator. 5. Break the roca into irregular pieces. Store in an airtight container at room temperature or freeze for longer storage. This was gorgeous and a calm introduction to the scary world of caramel making. If you follow the precise instructions you can’t go wrong. However, there is no time to spare so pre-measure the sugar, water, lemon juice, and corn syrup into a little bowl so your butter doesn’t burn. And make sure you have a pan with high sides. Almond Roca Recipe © 2006 Scharffen Berger Chocolate Maker, Inc. Photo © 2006 Deborah Jones. All rights reserved. All recipes and photos used with permission of the publisher.